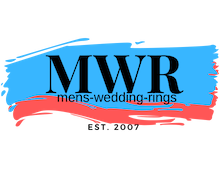 For men who love the colors of the sea, this men's tungsten ring has a shell inlay that captures the light and radiates with shades of blue, purple and green. 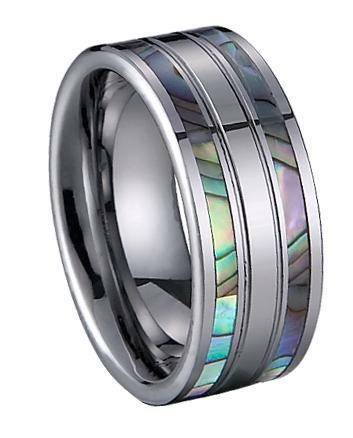 At 8 mm wide, it is made from durable tungsten with two bands of shell inlay and a band of metal in between. This eye-catching ring makes a beautiful men's wedding band! Inside, the edges of the band are rounded off for a very comfortable fit. Comfort-fit rings should be ordered 1/2 size smaller! This ring is not only great value, it is beautiful! And came in great time! Really cant fault anything about the ring or the service! We ordered this ring on a Tuesday, expecting it to arrive maybe within a week, if we were lucky, but we already had it in our hands on Friday. That alone was incredible. But if that wasn't enough, the ring is absolutely stunning. It looks even more beautiful in person than it does in the picture, and on top of that, it has the luxury of being truly unique thanks its the shell inlay. The price is more than fair for such an incredible ring. Thank you! !